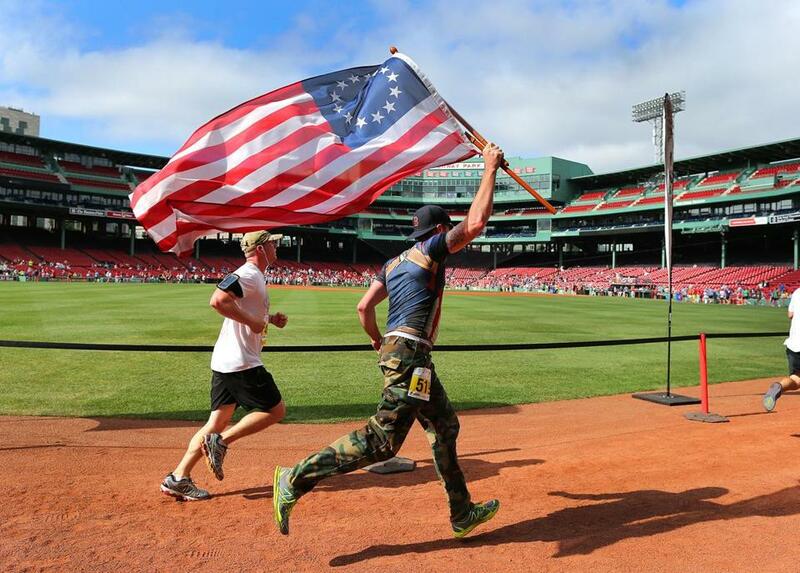 The annual Run to Home Base benefits the veterans support program run by Massachusetts General Hospital and the Red Sox. Bill Geiger’s clinician made what seemed like a simple request: walk 1 mile from his hotel in Charlestown to the Home Base offices at Bowdoin Square. It would take about 20 minutes. But to Geiger, an Army veteran of the Iraq war, it was as if he were being asked to walk barefoot on hot coals for hours. He swallowed his fears, kept in check the hyper-vigilance he took home from combat, and walked across the Washington Street bridge, past North Station, up the hill, and he made it. He’s much better because he went through a new, intensive clinical program treating the invisible wounds of war — post-traumatic stress and traumatic brain injury — at Home Base, the veterans support program run by Massachusetts General Hospital and the Red Sox. Initially more local in its outreach, the Home Base model has gone national, part of a network that includes centers in Los Angeles, Chicago, and Atlanta. Geiger came up from Florida to take part in the intensive clinical program that compresses into two weeks more traditional outpatient therapy that can take a year. The other day, Geiger and others stood in the building at the Navy Yard in Charlestown where the new program will move later this year. General Mark Milley, chief of staff of the US Army, walked over to Geiger and shook his hand. Milley grew up in Winchester, the son of a Somerville guy who hit the black beaches of Iwo Jima in 1945. Milley’s father Al was a 20-year-old Marine who went from battle to battle across the South Pacific in that last year of World War II, and Milley always knew his dad carried memories no one should have to carry. Milley’s empathy is striking. But even more significant, more reflective of a genuine cultural shift, was the presence and words of Vincent Ng, director of the Department of Veterans Affairs’ health care systems in Boston. When Home Base was founded in 2009, it positioned itself as a complement to a VA that was overwhelmed by the wars in Iraq and Afghanistan, the sort of private-public partnership that was needed to treat veterans who either could not get or were not eligible for VA services. (John W. Henry, principal owner of the Red Sox, who helped create Home Base, also owns The Boston Globe). The VA basically ignored Home Base, in part because it’s a federal bureaucracy, in part because of turf issues. But that attitude has changed dramatically, and in March the VA, Home Base, and the Warrior Care Network signed an agreement that allows for record-sharing and puts them on the same page. VA social workers now can work with Home Base. Rather than be defensive, Vince Ng is pragmatic. Part of that gap is due to the fact that the VA by its own rules is not able to provide services to vets who receive a less than honorable discharge, even if that discharge is the result of behavior attributed to post-traumatic stress or traumatic brain injury suffered in combat. Jack Hammond, the retired Army brigadier general who is Home Base’s executive director, and Mike Allard, Home Base’s chief operating officer, met with VA Secretary Bob McDonald in Washington and sensed a new collaborative approach. They say Vince Ng couldn’t be more accommodating. There are many good and dedicated professionals in the VA system, committed to vets. Recalibrating that system to help all vets, letting go where needed, honors their service even more.